One of the great things about My Little Pony is the diversity of the characters. Each pony’s beauty mark is a sign to the world about what makes them unique. There’s no hiding in the crowd here. No trying to be just like everybody else. Fluttershy is the pony that so many little boys and girls can relate to. Quiet, reserved, and always willing to make friends. Not every Pegasus pony in Equestria is the same. Just ask Rainbow Dash and Fluttershy. While Rainbow Dash is bold and daring, Fluttershy is quite reserved and caring. But that’s what makes Fluttershy such a wonderful friend to everyone around her, whether they’re her pony friends, like Twilight Sparkle, Rarity, Pinkie Pie, Applejack and, yes, even Rainbow Dash , or her non-equestrian friends, like Angel the bunny. Join in for five adventures that feature everypony’s lovably quiet Pegasus, Fluttershy. I still have most of my ponies from when I was a kid. E2 has now collected them into her pile of play things and they take their place alongside the Monster High dolls and (of course) the Barbies. The ponies always manage to work out their difficulties, don’t they? And still remain friends with the rest of the crew. Including friends who are different species even. Real people could learn a lot from them. This newest DVD is available beginning today for a suggested retail price of $15. Pretty cheap for approximately 2 hours of entertainment. Any slumber parties coming up? I think I’ve found your entertainment. There’s even a sing-a-long feature You’re welcome in advance. This My Little Ponyseries is best suited for kids between the ages of 6-9. I certainly don’t see any harm in younger kids watching this – I just don’t think the themes will quite resonate with them. The lovely bunch over at Shout! Kids have not only given me a copy to review, they also have a DVD to send to one of my lucky readers. Enter using the Rafflecopter form below. Open to residents of Canada and the US. Approximate retail value of the prize is $15. Not responsible for lost or misdirected entries. Odds of winning will depend on the number of eligible entries received. Giveaway ends September 26, 2017 11:59 pm ET. Good luck everybody! 12 Responses to "MLP – Friendship is Magic: Fluttershy Giveaway"
I woud love to win this for my daughter, it would be a great Christmas present. She stands out because she's is a very caring friend! I would give it to my granddaughter who loves to explore and learn about new things. Would love to give this to my niece, what make her stand out is her happy all the time personaility. 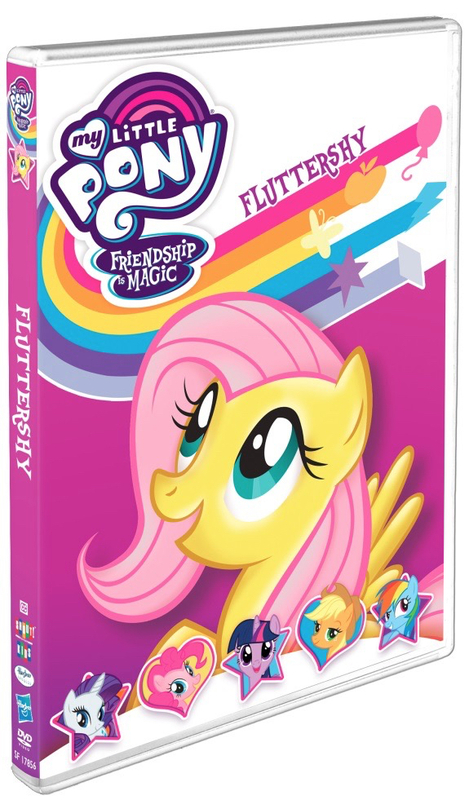 It would be great to win the My Little Pony Friendship is Magic Fluttershy DVD. In response to your questions of Who are you going to give this to and what makes them stand out? I am going to give this DVD to my niece who has a great sense of humor and she likes to sing. Thank you for having this contest. I want to give this to my daughter because she isn't afraid to be herself. My three year old son 4, 8, 11 year old nieces love My little pony ! !